Summary: This walk is best done in late August or early September and on a sunny day for when the sun shines down on the heather in bloom on Hathersage Moor it provides the most wonderful spectacle. 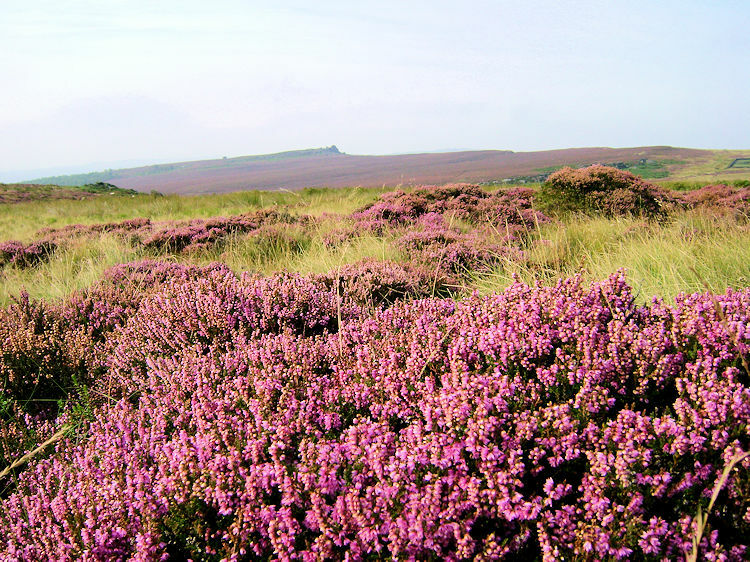 The beauty of the heather moorland is contrasted by the wonderful millstone outcrops encountered during the walk and there are many to salivate over like Over Owler Top, Winyards Nick, Higger Tor, Carl Wark Hill Fort and Burbage Edge which is the source of Burbage Brook. 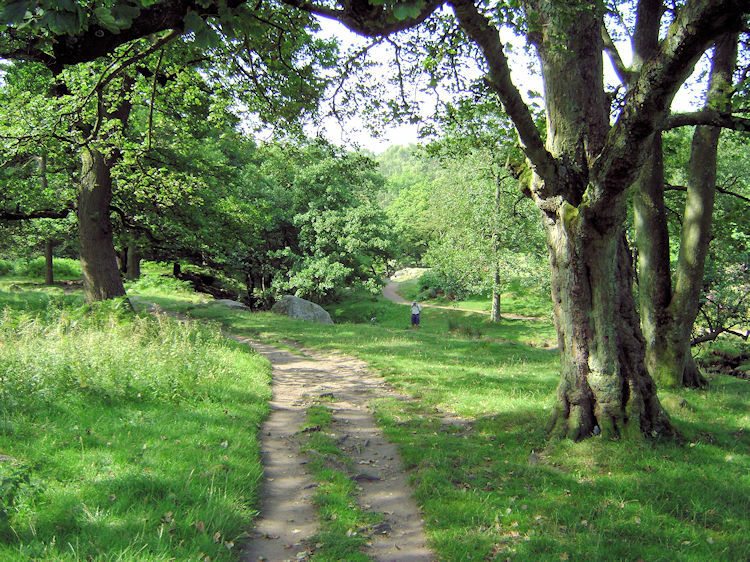 Follow the brook for a while and then leave it for a delightful walk through woodland and the Longshaw Estate before rejoining the brook and following its course downstream through the Oak woodland of Padley Gorge as it flows down to join the River Derwent. Finally leave the gorge woodland on a path over heather moor back to Surprise View. The Walk:I had driven on the A6187 past the location of this walk many times from North Yorkshire on my way to walks further into the Peak District, sometimes noticing families and walkers strolling around the area of the Surprise View car park and often wondered what was the attraction. Lovely views from the high summit to the valley below and Hathersage no doubt and the fun of playing on a heather moor much like I did in my childhood days on the North York Moors near Osmotherley. However, my error was not to investigate further and only when I did was this jewel of a walk found, a perfect moderate walk which, if I had more time, I would have made further. 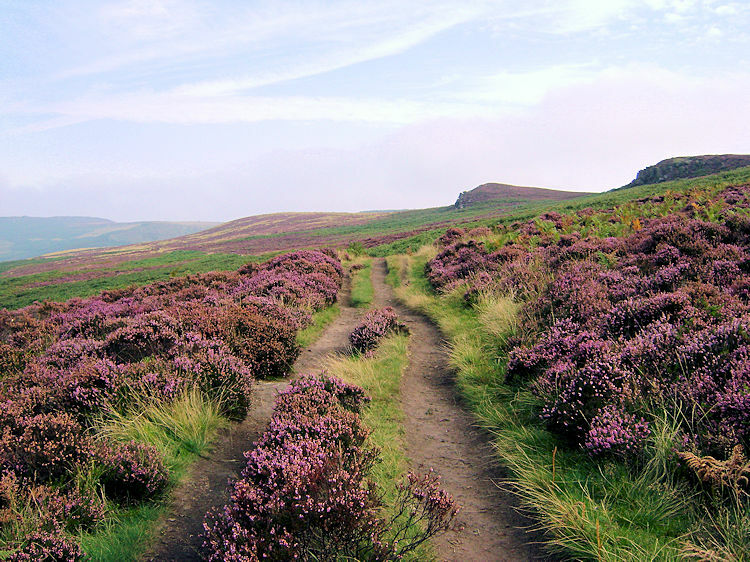 As it was there was plenty to seek out in the few hours I had available and with it being a wonderful sunny late summer's day I thrived walking amidst glorious purple heather bloom. After getting up at the crack of dawn and driving over from Harrogate in less than two hours I managed to beat the traffic and get to Surprise View early enough to be the first car in the very popular car park. Being late summer mist was still clearing as I set off on the walk but with a brilliant weather forecast in mind I hoped for the sun to burn through quite quickly. True to the forecast, the sun was peering through the high cloud as I made my way from the car park which took me immediately onto a narrow path through swathes of brilliant heather. Glints of sun were already breaking through to make the colour purple all the more vivid and this sparkle of colour spurred me on past Millstone Edge towards the noted rock outcrops of Over Owler Tor and Winyards Nick. A particular draw to the eye was Mother Cap, a small statuesque rock obelisk shaped like a mushroom. 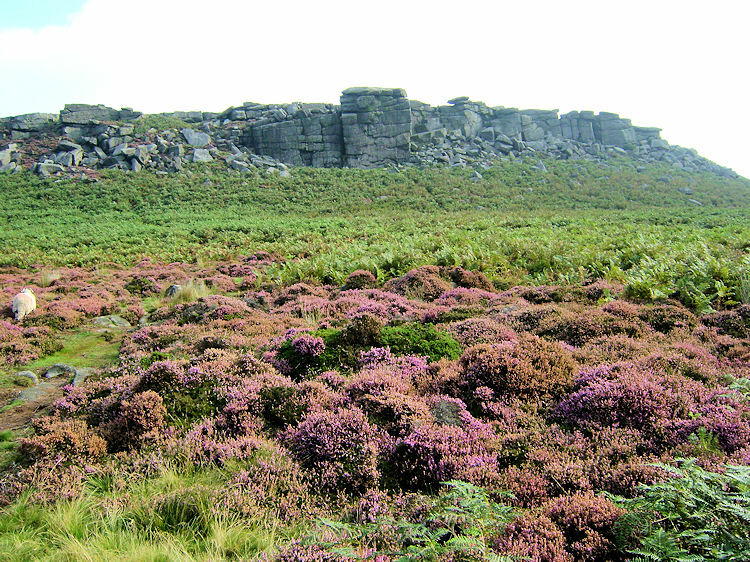 Continuing on, I walked over the edge of the moor due north towards a rock platform above the heather. It was a magnificent sight that drew me forwards, it was Higger Tor. The imposing grit stone ridge of Higger Tor kept me focused straight on but there were challenges from views to my left with Hathersage nearest and then the fabulous Hope Valley beyond. 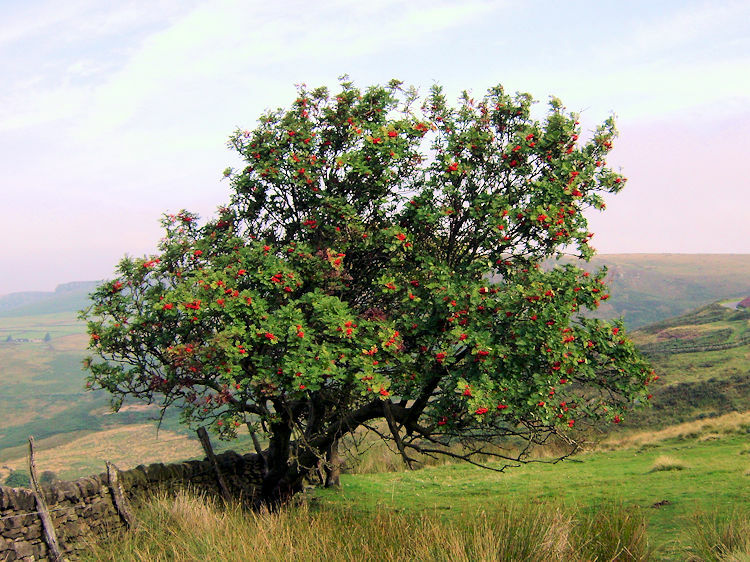 I stopped beside a beautiful Rowan Tree loaded with berries and looked to the limestone quarry and cement works six miles due west of me near Castleton and thought of the time I sat and dreamed of the wonderful British Countryside while resting directly above the cement works with Steve, Dave and Joe on a short walking holiday six years ago. As today, that had been a lovely sunny day when we did the Mam Tor Ridge Walk. Oh what good memories. 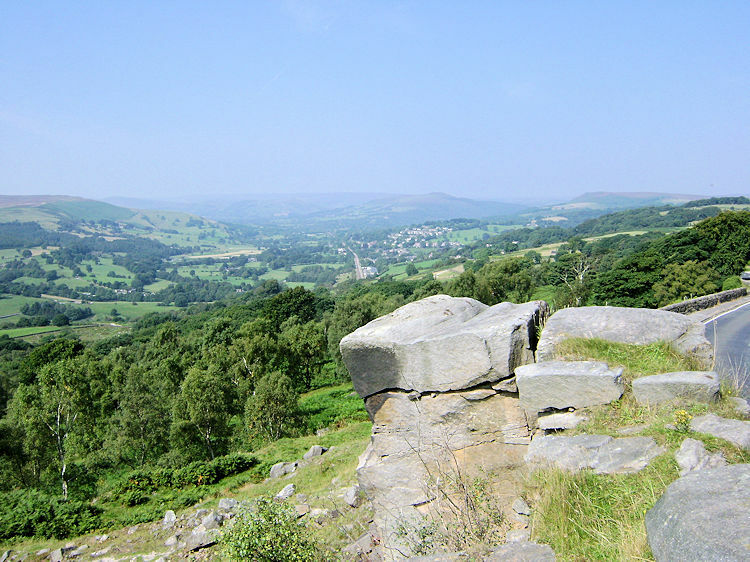 Snapping out of my dream world I reverted to the present and the wondrous views of today to continue my climb up to Higger Tor for a joyful scramble in the rocks. I had fun on the rock table of Higger Tor and bounded about feeling much younger that my advancing years. That is what walking does for me, it keeps me wanting to explore and seek out more, it keeps me wanting to revert to the child in me and it fuels a lust for life like nothing else. 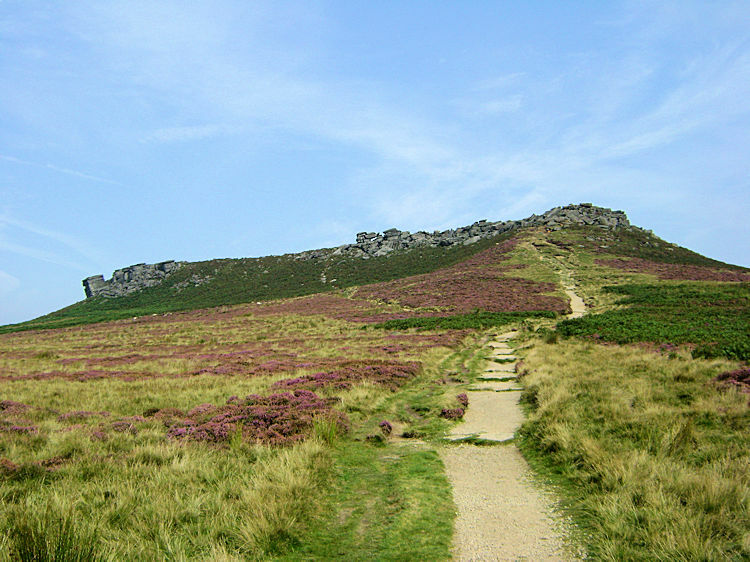 With such a countryside as we enjoy on these isles I cannot imagine ever stopping but to keep going as long as physically possible to go to places like Higger Tor and that is why after playing on top of the table called Higger Tor I wanted for more and set my eyes on the next new adventure, the ancient hill fort of Carl Wark. Like being on a fairground roller coaster ride I scampered down from the tor and across Hathersage Moor to ascent another rock outcrop which took me onto Carl Wark. Atop of the ancient place I found a commemorative plaque which read 'This is a hill fort of a type constructed in the Iron Age, 2000-2500 years ago. It may have been refortified at the end of the Roman period. 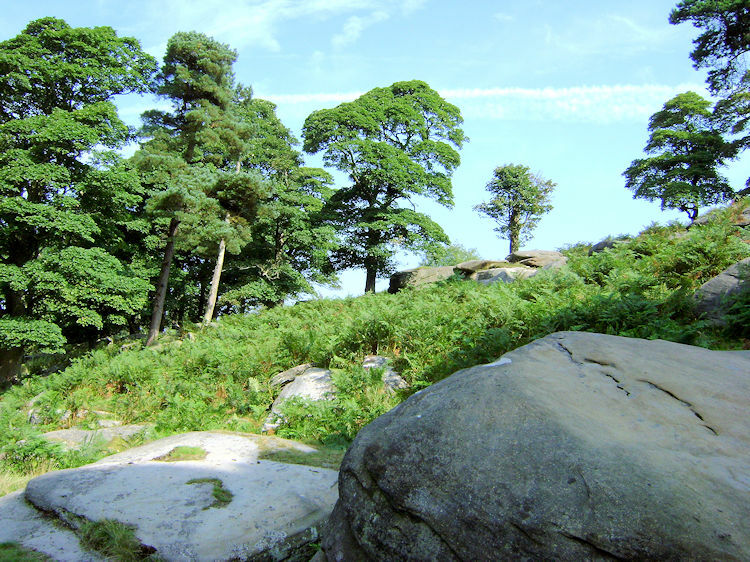 The natural plateau, with an area of about 2 acres was defended on the North and South by walls of gritstone boulders, the steep slope on the East forming a natural defence. An earth rampart, 20 feet wide at the base and faced with a stone wall defends the West side. The original entrance lies at the South West corner where the defensive wall turns inwards' The commemorative concludes with a request for respect. I duly paid my respect and contemplated of how this place may have been in those austere times with a deep appreciation. In thrall of all the walking surrounded by fabulous scenery, the excitement of bounding on millstone outcrops and the visit to a place of ancient history the sun had burnt away the mist and high cloud and it was now blazing down. In respect of the wonderful sunshine the colours of the flora had maximised their potential. 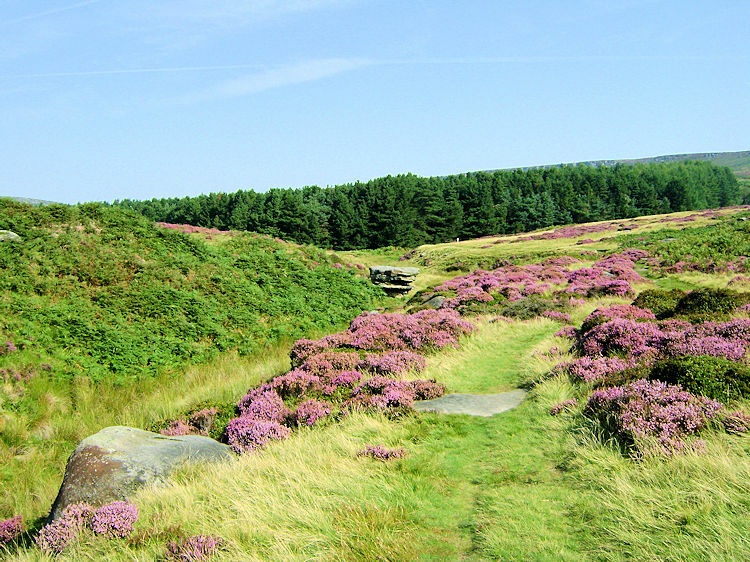 The heather was shining and the trees of a plantation near Burbage Brook were brilliant green. All around the colour was fabulous, surely not better at any other time of the year. 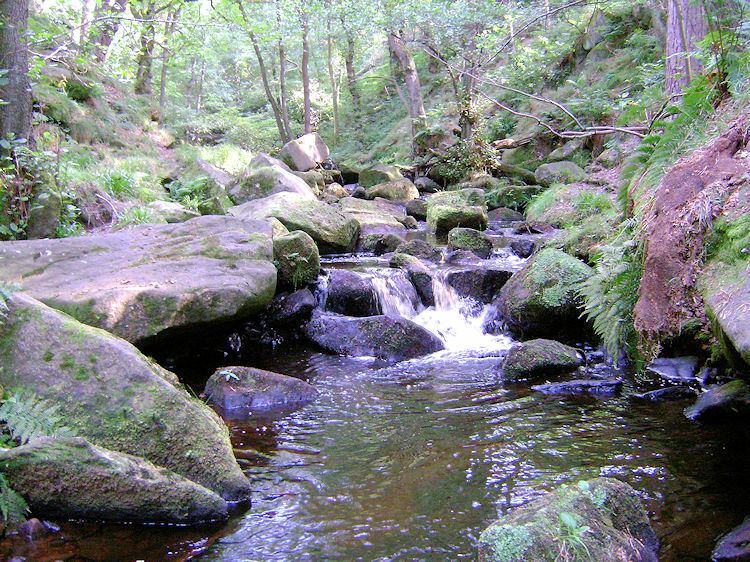 I left Carl Wark and descended to the brook which I crossed via a delightful stone footbridge. From the footbridge I followed the brook downstream on a lovely amble towards Burbage Bridge. Other walkers had arrived by now and I passed pleasantries a couple of times. All I met agreed it was the best of days. 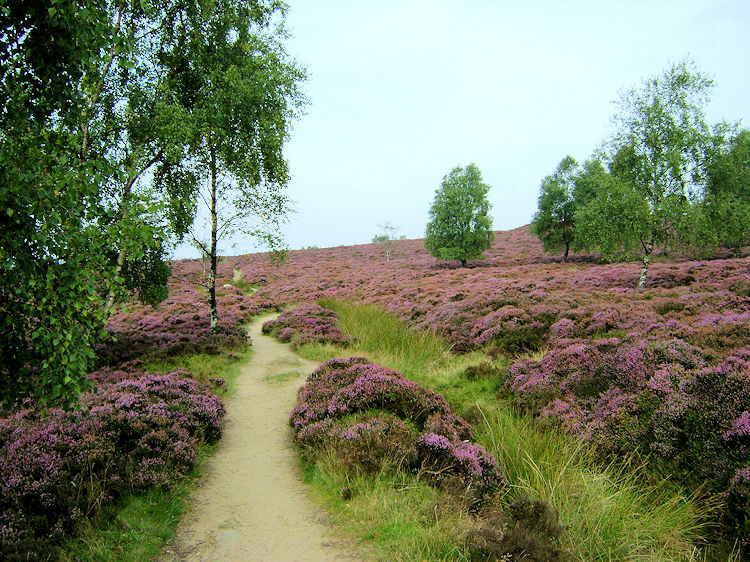 I left the moorland at Burbage Bridge and carefully crossed the A6187 to enter the Longshaw National Trust Estate. First impressions are always defining and the walk through a deciduous wooded area of native English trees including oak and yew was tremendous. I even passed a bench with seating for three carved out of a huge tree trunk. I think it will be there for a very long time. 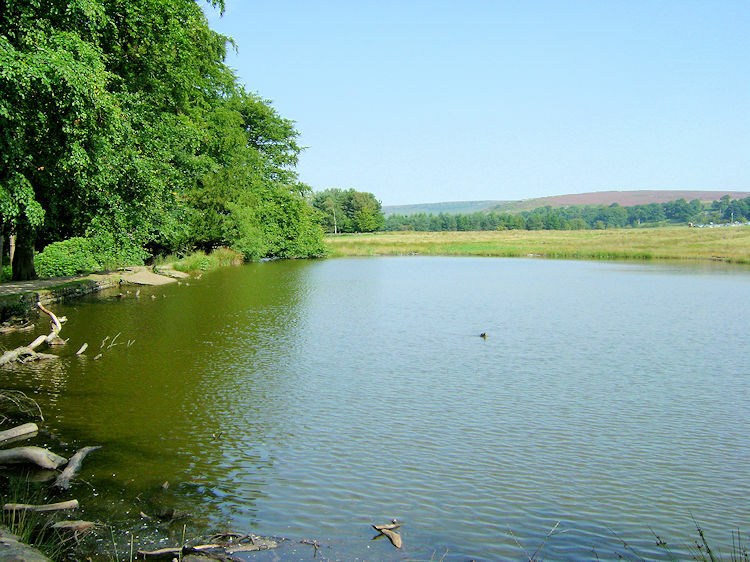 After 400 metres of walking through the enchantment I crossed over the B6521 Padley Road and into the Longshaw Lodge access road and past the sumptuous building towards a pond on the edge of Granby Wood. The pond was the habitat of some very friendly ducks who are obviously well looked after for they approached me for a snack. Alas I had nothing to give them. From the pond I continued on through more fantastic woodland before leaving the lovely and memorable Longshaw estate by crossing the B6521 again. Overcome by all the delightful walking thus far, I continued to be overcome with spectacular events. 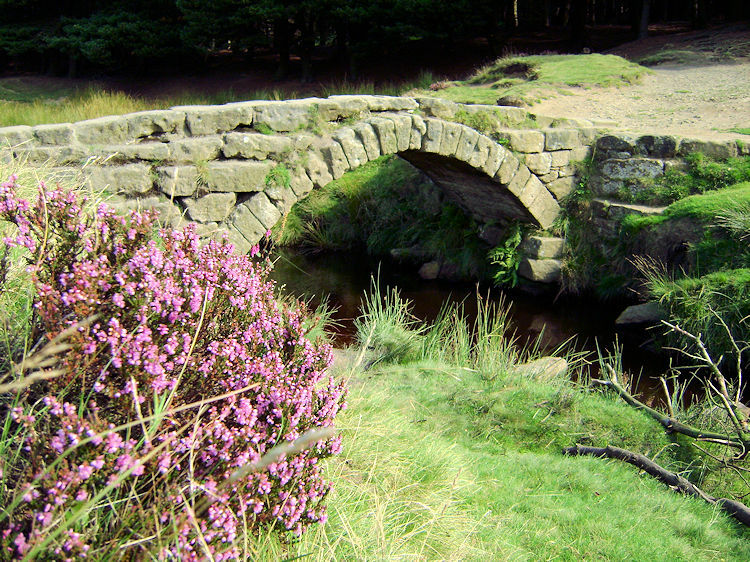 First was the sight of rejoining the course of Burbage Brook near Lawrence Field. It was now late morning and I came into the midst of lots of families enjoying the peaceful surroundings with many young children paddling in safe pool areas of the brook. Others picnicked, mainly parents and grandparents while the young folk made their early explorations. Some, no doubt, will explore like me for years to come. I left the throng to follow the brook downstream through Yarncliffe Wood. Soon there was just me again and the path suddenly became steeper. I was entering Padley Gorge. I walked down and down into the depths of the gorge and as I did so it got darker as the tree canopy deepened above me. Sunlight shimmered through not basking me but giving a super sparkling light. It was hot out in the sun now but I had my natural parasol. I walked joyfully through the curtains of light and dark for a while. Then after some careful seeking I found a path that took me down to Burbage Brook which I crossed to continue the Padley Gorge exploration. I wandered on the north side of Burbage Brook for some time and still in the cool confines beneath the tree canopy before deciding I had gone far enough. 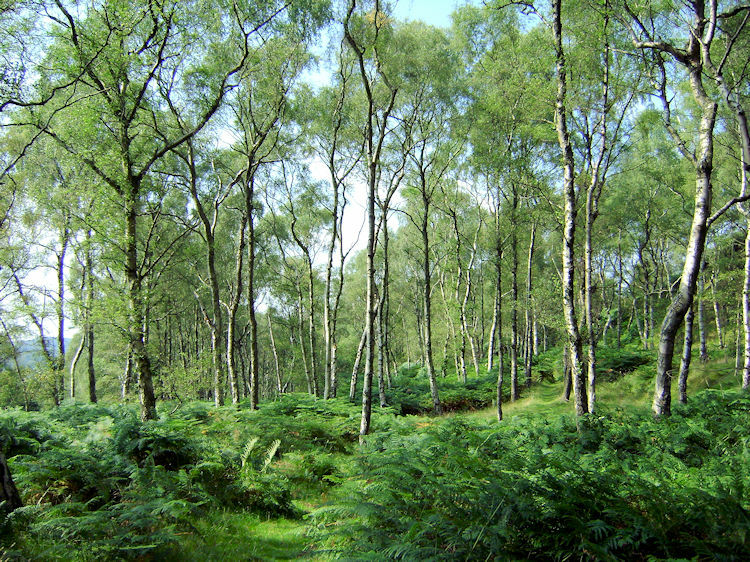 It was time to leave the woodland but it was a reluctant departure for the wood of oak and silver birch was entrancing me to stay. After a false path which took me up to a fern field near Bolehill Quarry which would have been dangerous to cross I backtracked and found the true path up out of the wood and back to heather moor. Once in the light again I warmed and rested for a drink as the short climb and glaring sun combination had temporarily exhausted me. Tired but ecstatic I soon regained the momentum to ascend back to my start at Surprise View. At the viewpoint I stood for a while to soak it all in. I was done but had I the time I would have done it all over again. It was that good, a perfectly beautiful walk in brilliant English countryside at it's best. Wonderful.